The Department of Motor Vehicles blamed registrations on a "processing error." More than a thousand noncitizens may have been registered to vote in California after a processing error, according to officials. The Department of Motor Vehicles admitted Monday a mistake caused as many as 1,500 noncitizens being registered to vote in the state. "I got this post card thing, this little piece of cardboard, and it said, 'Congratulations, you're registered to vote,'" Marquis told Sacramento ABC affiliate KXTV. "I thought, 'Oh, that's the stupidest thing I've ever heard,' and I threw it out." The Newport Beach, California, resident rethought moving on, and decided to alert someone because of a series of voter registration errors in the state. The error is the second pertaining to voter registration errors in as many months for the DMV. The DMV notified Secretary of State Alex Padilla in early September that some 23,000 Californians had their registrations handled incorrectly, including some being assigned the wrong political party. 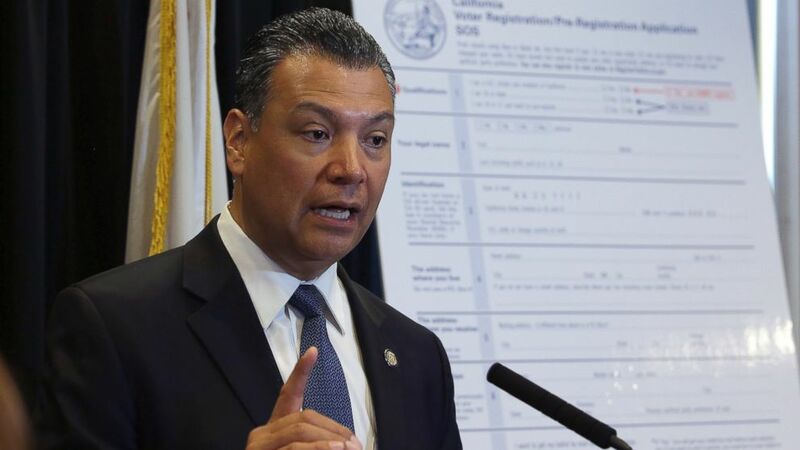 (AP) In this April 5, 2018, file photo, California Secretary of State Alex Padilla speaks in Sacramento, Calif. Padilla is urging Californians to oppose the Trump administration plan for a citizenship question on the 2020 census. "An extensive external audit by our departments found that approximately 1,500 customers may have been registered to vote in error," the letter from the DMV to Padilla read. "This error has been corrected and is separate from the processing error we notified you about in writing on September 5. "This error occurred when DMV technicians processed customer requests at field offices to change voter eligibility responses on driver license applications," the letter continued. "Due to the order in which the change was processed, the customer's initial responses were retained instead of the correct and revised responses." The DMV also specified that none of the impacted customers were undocumented immigrants. "We have worked quickly with the Department of Technology to correct these errors and have also updated the programming and added additional safeguards to improve this process," DMV Director Jean Shiomoto said in a statement to KXTV. Padilla's Republican opponent in this year's election, Mark Meuser, seized on the mistake Monday in a tweet claiming the error was another sign of his incompetence. Meuser also referred to them as "fraudulent" registrations, instead of an error as the DMV said. "If they're still making these mistakes, it shouldn't be hidden," Marquis said. "Somebody should know about it. "I don't think that anybody's trying to commit fraud here," he added. "I think that they're just not up to the task of doing their jobs correctly."